Rafa was invited by Bulat Utemuratov, the President of the Kazakhstan Tennis Federation, to spend some time in Kazakhstan this week. Rather than rack my brains to come up with matchless prose, here is a recap of the trip from a local paper, Tengri News. Spanish tennis professional, World No.2 Rafael Nadal has presented his tennis racket to Kazakhstan’s President Nursultan Nazarbayev during his visit to Astana, Tengrinews reports. On September 24, Spanish tennis player Rafael Nadal and French tennis professional Jo-Wilfried Tsonga arrived in Astana to play in an exhibition match on September 25 at the National Tennis Center. The Spanish tennis professional beat his French counterpart with a final score of 6:4. Before the game, Kazakh President Nursultan Nazarbayev had a meeting with Rafael Nadal and Jo-Wilfried Tsonga, where he emphasised the role that their visit played for the development of tennis in Kazakhstan. “This is a landmark event for aspiring Kazakh athletes. You provided them an opportunity to play with you, which was a huge incentive for them. Besides, you were able to see our country and visit the capital’s major sights,” Nursultan Nazarbayev said. According to the Kazakh President, currently, Kazakhstan is doing a lot of work to popularize tennis in the country. “For example, I started playing tennis after the age of 40. But now tennis centers are being constructed throughout the country. Kazakhstan is working to promote tennis. Of course, we are nowhere near Spain yet, but eventually we will be able to train decent player of our own,” the Kazakh President said. 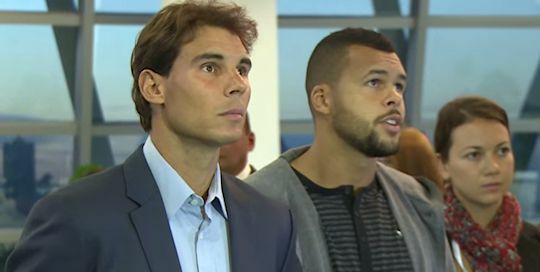 Rafael Nadal and Jo-Wilfried Tsonga thanked for the invitation adding that it was a big honor to come to Kazakhstan. They expressed hope that their visit and exhibition matches would raise interest to tennis in the country. During their visit, the guests toured Astana’s popular sights, visited Astana-based Nazarbayev University, and gave a master-class to young Kazakh tennis players from Team Kazakhstan tennis academy that is selecting and training the most outstanding and promising young tennis players in Kazakhstan. In addition, they visited Borovoe resort area. “We had lunch at the hotel. Borovoe has spectacular views and I liked it very much. I like to learn something new and Kazakhstan is a new country for me,” Rafael Nadal said. The event was organized by Kazakhstan's Tennis Federation to promote tennis and inspire young tennis players. "This visit is a priceless opportunity for our young tennis players and the younger generation of tennis professionals to see a living legend," President of Kazakhstan’s Tennis Federation Bulat Utemuratov said. Rafael Nadal is World No.2, winner of 14 Grand Slam singles titles, 2008 Olympic gold medal in singles and record 27 ATP World Tour Masters 1000 titles. Nadal holds the record for the most number of consecutive titles at any particular tournament after winning his eighth straight Monte-Carlo Masters in 2012. Jo-Wilfried Tsonga is World No.12, winner of 11 ATP singles titles and 2012 London Olympics silver medal winner in men's doubles with Michael Llodra. Tsonga remains the only player to boast a win against each of The Big Four at Grand Slam tournaments. The big four are the tennis players that are considered dominant in terms of ranking and tournament victories: Scottish Andy Murray, Spanish Rafael Nadal, Serbian Novak Djokovic and Swiss Roger Federer. This news report shows their meeting with the President of Kazakhstan and some brief footage of the master-class. Here's some more footage of their meeting with the President and highlights of the doubles match they played with local juniors before the main event. It may have been an exhibition match but it was just wonderful to see Rafa back on court.